Well I do love riding. I don't discriminate, a ride is a ride and a good one can be recognized when you smile, push and make unspeakable noises all in a few miles. This year I've been obsessed with creating Mixed Terrain routes complete with cue sheet and all so others can have the same fun I'm having. 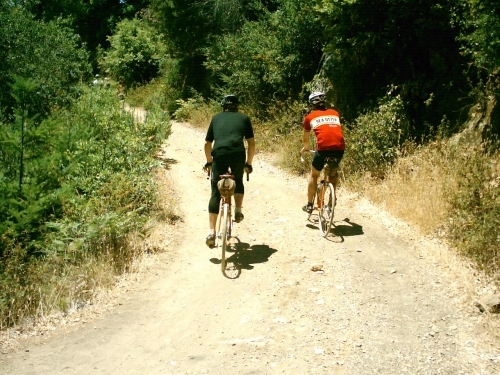 These are rides that cover both paved and unpaved roads and can be done in almost any bicycle. In my neck of the woods, San Francisco, I use mostly the paved and gravel roads of the Golden Gate National Recreation Area (GGNRA) Mt. Tam and South Marin in general. The rides are tough because of the amount of climbing involved and are definitely not for beginners. Not so much because of the small technical skills needed but the endurance required. If you do any of these rides and have a GPS toy on your bike please send me the total elevation gain, people have been asking me for that and I have not found the time to create the routes at RouteSlip or Bikely. I think nowdays both of them can provide elevation for a route. Anyhow the idea of Mixed Terrain rides has been gaining baby momentum amongst San Francisco Randonneurs; recently we have had some memorable ones. I started the official Mixed Terrain "season" around here with a posting/invitation on the SFRandon list @ Yahoo groups. Little by little new faces had been showing up for these rides. At the end of every ride people are happy, tired, wasted and hungry for more so we must be doing something right. So far on my quest to create a Mixed Terrain route about 200 kilometers long that starts at the GGB I have come up with three nice rides. When combined they will become "La Ruta Loca" a 200 kms. of crazy ups and downs and I mean that. I will submit the route to the San Francisco Randonneurs for consideration/inclusion into the brevet schedule. We cross the Golden Gate Bridge and climb Conzelman to the top then take the crazy descent into Bunker Rd, ride towards the Marin mammal Center but take the Miwok trail as soon as we see it, climb on Bobcat to Marincello and descent into the Miwok Stables. 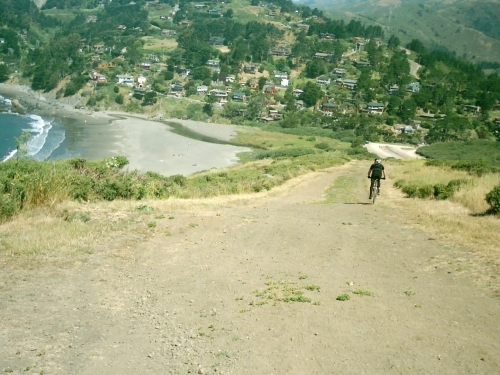 Continue on Tennessee Valley to Coastal, then descent onto Muir Beach. At this point we join Hwy 1 for a little while and then take Muir Woods Rd. 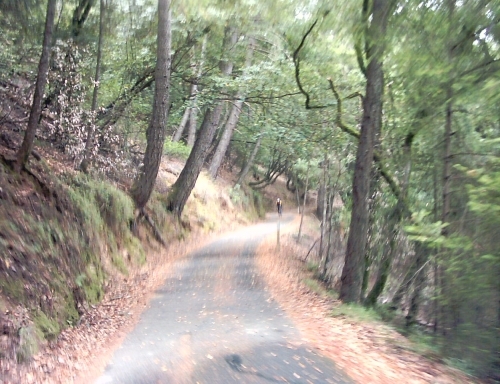 before the Muir Woods park we take Deer Park a great fireroad that goes up, up, up to the Pantoll Ranger Station. This is a good spot for lunch or a water break. After that, climb a little on East Ridgecrest Blvd. and take the Rock Springs Lagunitas to Lake Lagunitas, lovely views and a steep descent. Then ride to Five Corners and then to Concrete Pipe to get to Fairfax Bolinas Rd. Descent into civilization to Fairfax where we can have a coffee and sconne at the Java Hut. Return to San Francisco via the regular bicycle way. This ride is about 60 miles and has some serious climbing but is is all done on maintained fireroads or paved roads. There are some sections of steep climbing on loose soil and also some good descents but the route has been conquered on all sorts of bicycles. A demanding ride with great rewards for those who do it. About 50%/50% Fireroad/pavement. The Mixed Terrain 101 (Intro to Mixed Terrain riding)"
This route Starts at the GG Bridge and follows the regular bike route to Camino Alto, we descend into Corte Madera and do a short version of the Paradise Drive loop, take E Blithedale to its end where we climb to the West Point Inn via Old Railroad Grade another of our great fireroads. Stop at West Point Inn for lunch but we could wait a little longer... Now descend a little to the Pantoll Ranger Station the other possible lunch break. Join Panoramic Hwy and then Hwy 1 for just a little while, at a sharp turn we take the Miwok fire road and connect it to Coastal using the Coyote Ridge trail. Down, down to Miwok Stables back up Marincello, Bobcat, Coastal Conzelman and finally the GG Bridge. A good 50 miles of riding, 17 of them on fireroads, approximately 5900 feet of climbing. It sounds short but believe me it is not a ride in the park but it is not a grueling ride either, just right. This makes a great first Mixed Terrain ride for an accomplished "roadie". Again the route has been done in all sorts of bikes, from Hardtail MTBs to road bikes with 28mm slicks. A short version of the upcoming 200kms route. A combination of the two previous rides. First do most of the Traditional Mixed Terrain Ride , on the way back to San Francisco instead of climbing Camino Alto, turn left towards Corte Madera following the Mixed Terrain 101 route from that point to the GG Bridge. The result is an 80 miler of 50%/50% fireroads/pavement. A tough, though ride that will test the endurance of most riders. Lots of climbing. Pack a bike light just in case. This is a ride that is done using the Traditional Mixed Terrain described before but instead of going down to Fairfax we climb to Bolinas Ridge then ride to Randall and descend on it to Hwy 1, move to Olema, Samuel P. Taylor using the bike route inside the park even the gravel part unknown to most cyclists. Then return to Fairfax on Sir Francis Drake, San Francisco via the regular bike route. This is a hard ride of about 80 miles, lots of climbing, ~9900ft. Most climbing done on fireroads, some of them are in better condition than others. Bolinas Ridge is notorious for being in excellent condition one day and bad two weeks later, also it can get cold inside that canopy of trees, be pepared for extreme weather conditions. Like all other rides here you face many different micro climates so clothes and food preparation are key. I proudly offer you my evil creation. If you complete this ride you deserve that title your significant other gave you when you started riding long distance events, brevets or whatever. This ride should be doable on almost any bike. If you use the cue sheets please send any corrections to the email address on them or post a comment on this page. Give credit when due, enjoy, and ride safely. You'll do very well on other brevets. A steady pace goes a long way but good riding partners are the difference between having a great day on the bike or just another ride. "a ride is a ride and a good one can be recognized when you smile, push and make unspeakable noises all in a few miles"
I definitely made some unspeakable noises, probably while smiling and soaking in the scenery, and certainly while pushing to get me and my fat bike up those last few climbs. It was great riding with you, see you soon! I am planning on doing the Del Puerto 200k, and then next season we'll see how long I can go! I'll say just ride. No matter what the distance is, get out there and enjoy what we have. You can start with just doing part of the routes. 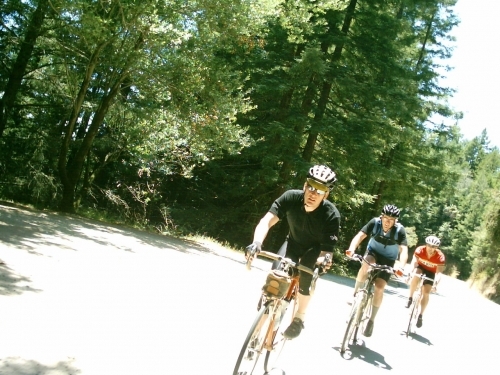 A great mellow ride is going up Railroad Grade to the West Point Inn or continue to the Top of Mt Tam. Easy climb and great views. If you get tired you just coast down to Mill Valley for coffee :) Another great rewarding relatively short ride is the headlands loop. You can start from the city go up Conzelman then take Coastal trail to Bunker Road and up Bobcat or Miwok to the Miwok Stables. Return via the same way or ride to Sausalito and return on the road. Nice routes, I've ridden quite a bit of it, but never in one shot. I'm curious if you have any other recommendations for mellow Mixter rides? My girlfriend loves the dirt, but would be swamped by some of those climbs. Thanks in advance. I hope people find them useful and use them. Carlos: Excellent job on the routes and cue sheets. This page is a great resource.